Many know him to be the C.E.O of one of Ghana's influential social media marketing agencies - Pressure Bois Inc and a musician. Over some few years, Kobby Stone has brilliantly risen to the circles of the most looked out for artistes in Ghana. His persistence in pursuing his music career has earned him a spot on the 'London Le Blanc Magazine'. Le Blanc Music Magazine, with this edition celebrates its second year in business. 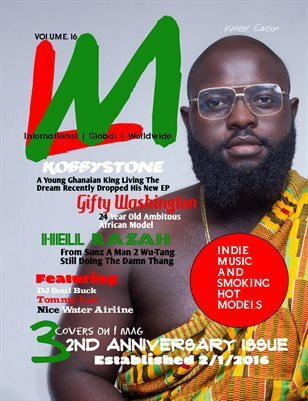 This issue released a triple cover featuring Hell Razah of Wu Tang/Sunz of Man, Kobby Stone and Gifty Washington (a Ghanaian model). In the magazine, Kobby shared how he foresees his music career in Ghana and how he is poised to cultivate and serve a huge fanbase, both nation and global wide. In addition, Kobby Stone unveiled his plans for his marketing outfit - Pressure Bois, Inc.